Azure’s Camp Awesome began a mere two days after Alex’s Camp Awesome. This year Azure asked to bring a friend with her as well. It was a quick turn-around to get all the bedding and towels washed in preparation for two more visitors. I picked up Azure and her friend, McKenna, in Woodbury. After a quick lunch, we headed to the Minnesota History Center. It was very hot out so we opted for air conditioning. We went through the Greatest Generation; Then, Now, Wow! ; Weather Permitting; U.S.-Dakota War of 1862; and Grainland exhibits. The girls got to pretend to shoot off dynamite in a mine, plow the fields, live in a sod house, and be grain in a grain elevator. We also experienced a tornado from inside a basement and got to make our own Paul Bunyan and Babe puppets. Because it was so hot out, we decided to eat out at Chatterbox Pub. We played a few retro Nintendo and board games. Naturally, we also stopped at Sebastian Joe’s for some ice cream before heading to ComedySportz. On Friday we met Adam downtown for lunch. The girls weren’t excited by the options the food trucks had to offer so we ate at Potbelly instead. I took Azure and McKenna exploring through downtown Minneapolis. 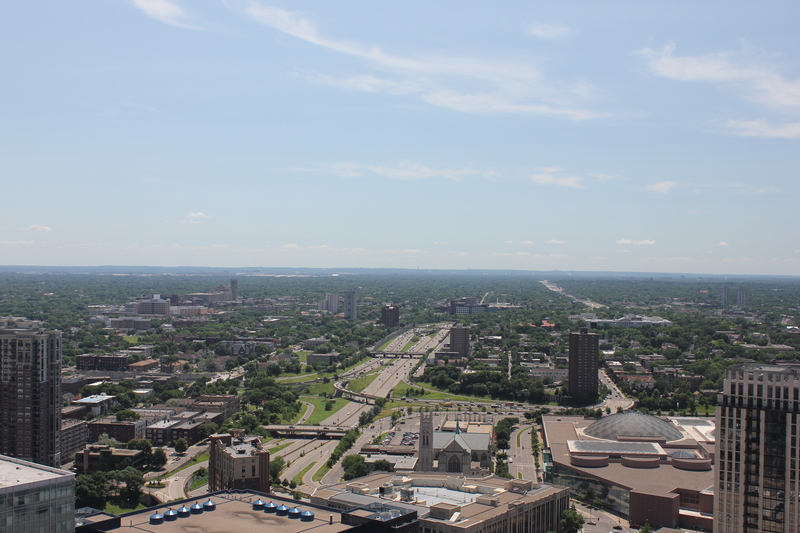 We started at the Foshay Tower to view the city from atop a skyscraper. Then we walked towards the river and saw the old flour mills, the Guthrie Theater, and Stone Arch Bridge. We attempted to play mini-golf in the sculpture garden at the Walker but there was over an hour-long wait to played. We spent a little time walking around the garden instead and got misted by the cherry and spoon bridge. After Adam was done with work, we went to AirMaxx Trampoline Park for the teen night. Again, it was surprisingly empty. We got the package that gave us unlimited jump time plus laser tag, arcade games, and mini golf. The girls especially had a lot of fun jumping into the foam pit. McKenna had no problem doing intricate flips while Azure was afraid of landing on her face. We started our Saturday with our tradition of reading at the coffee shop. Azure was excited to get answers about the TV show from her book in the Pretty Little Liars series. We spent the afternoon at the Bell Museum of Natural History. This was our first time going to this museum. Most of the exhibits were what you would expect from a smaller, local natural history museum. The special exhibit on soils was unexpectedly interesting. We also go a tour of the solar system in the ExploraDome planetarium. Our tour of museums continued on to the Science Museum of Minnesota. We were able to see the Omnitheater film and exhibit on Maya. McKenna was especially entranced by the wrap-around screen of the theater. The Maya exhibit was much more than I was expecting it would be. There was a lot of artifacts that I was expecting to see like rock carvings, paintings and various forms of pottery. There also is an interactive portion where you can create your own Mayan name and birthdate using Mayan glyphs. We learned that you need at least 2 hours to make it through the exhibit. After a day of learning, we had worked up an appetite. We ate at Cosetta’s, an old Italian restaurant and deli, in downtown St. Paul. After dinner we celebrated the end of Aquatennial with the rest of Minneapolis at the annual fireworks show. We watched the fireworks with our friend Scott on the grassy hill near the Guthrie. On Sunday we went to Como Zoo. Azure got to see a few of her favorite animals, including the giraffes. That evening we went to Vali-Hi drive-in in Woodbury where we saw Despicable Me 2. Both Azure and McKenna were very excited to see the minions again. We played Spot-It and read books while we waited for the movie to start. This was the second time seeing Despicable Me 2 for Adam and me. We both got a lot more out of the movie the second time and really enjoyed it. Azure and McKenna had been especially anticipating stand up paddleboarding. We took the girls to Lake Harriet for paddleboarding on Monday. It was a little windy again like it was when we went with Alex. Despite this we had a good time. We had a picnic at the lake and spent some time at the beach where we saw a soft-shelled turtle — one of my favorite animals! We followed that up with a scavenger hunt and frozen yogurt at Freestyle. Tuesday was the girls’ last full day at camp. We woke the girls up early to go blueberry and strawberry picking. The blueberries were just beginning their season while the strawberries were at the end of theirs. Within an hour, we had picked a flat of blueberries and a flat of the few remaining strawberries. Azure and McKenna had seen that Cimorelli was going to play at Mall of America on Tuesday afternoon. We assumed the concert was going to be in the rotunda so we arrived just before the concert started. The rotunda was empty when we got there and found out it was at The Porch in Nickelodeon Universe. Unfortunately they had roped off the stage area and required wristbands to enter. We were able to listen from far away but never got much of a view. After the disappointment at the concert we headed to the Edina Pool. The Edina Pool has a pirate ship zip line, tube and body slides, and a Flow Rider. Azure and McKenna had fun riding down the tube slides and tipping over at the end, and zipping down the zip line.